Walking into Sorellina at 1 Huntington Avenue, I already knew I was in for a treat. I had heard nothing but rave reviews of Chef/Owner Jamie Mammano’s sister restaurants: L’Andana (located outside the city in Burlington MA), Mistral (my next stop for restaurant week! ), Mooo… (I visited last year& am searching for a special occasion to return), and Teatro (a theater district gem). After being led to our table I was confident that my evening would live up to the expectations. My party of 4 took our seats; the boys in their chairs & the girls on the booth side which extended from one side of the room to the other, connecting all the diners on a sofa-like seating arrangements. Every few tables even had pillows to lean on! I hadn’t even opened the menu and I was already thrilled. From the floor-to-ceiling windows, to the back-lit full wall mural, to the tree/branch theme, I was enthralled with the atmosphere and felt welcome & comfortable. Bread: On a rectangular plate we were brought a 10” loaf with 4 pre-cut pieces. I enjoy when the bread is appropriately rationed out, so as not to waste any leftovers. The pieces were generous in size, had a crunchy top, and tasted great with a little butter. We asked for more, but I held back on seconds – I had my 3 courses to focus on. Menu: This restaurant week menu had a couple more options than others, which made it (almost) difficult to make a decision. I was torn between the pasta meal & steak dish for my entrée, but after seeing the mushrooms that accompanied the meat I was able to choose the following for my 3 courses: Calamari, Pappardelle, Ciocollato. Presentation: The grilled calarmi primi must have been a special addition, because in doing my research I couldn’t find it on any Sorellina web menu, so my description may lack some detail. What I can tell you is that I’ve never had grilled calamari like this before. Presented in a bowl with a narrow bottom & wide rim (making it difficult to scrounge up every last piece! ), the squid was accompanied by what I believe to be a ‘tempestine’ pasta (imagine an orzo pasta but smaller and round.. something you’d find in a soup). The combination gave the dish substance & the hint of red pepper flakes provided the right amount of zip. 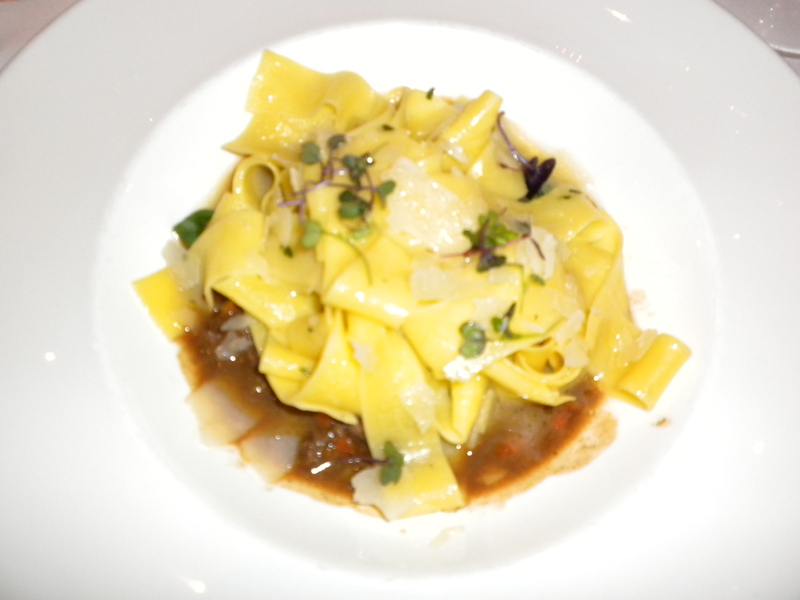 The pappardelle came with braised rabbit ragu & shaved Pecorino Toscano (cheese made from sheep’s milk). The ragu came underneath the pasta, soaking in a delicious, slightly buttery sauce, which gave the pappardelle major flavor. The pairing of the pasta with the tender rabbit made this dish outstanding. The table also ordered a side of truffled fries with parmigiano, which came in a small cast iron pot. I was dining with a few ketchup freaks who asked for a side, and we were delivered a generous portion in a small square bowl which they requested I make a note about 🙂 The ciocollato is described on the menu as a chilled chocolate Budino, with crème fraiche & amarene cherries. Really, all I saw was “chocolate” and I went for it. I’m not positive what a “Budino” is, so I’ll describe it as a torte, which was thick & rich with a strong smokey after taste. My two friends ordered the same, and one could barely eat hers because of the “torchy” taste. I’m assuming this feature was on purpose, and I didn’t dislike it enough to stop eating. It was definitely a taste I never had before in a dessert (besides S’mores), and despite leaving some on my plate (it was just so rich), I did enjoy it. Bathroom: While they are single stalls/rooms, there are at least a couple women’s & men’s doors to choose from in case one is occupied. The restroom itself was chic & modern with a small-tiled warm toned floor. The mirror was large and circular hanging from a rope/ribbon. The sink was rectangular, smooth and somewhat transparent, lit from below. No complaints except for the old-fashioned lock which almost held me captive. Wait Staff: The front of the house was welcoming and led us to our table in the center of the triangular-shaped room. Our waiter Kirk was attentive & able to suggest for me a dry red wine when I was having trouble telling them apart (I love red wine, but usually stick to Merlot or Malbec). I have to say I was a little intimidated by him though; he was knowledgeable & delivered everything promptly, but he didn’t really smile and seemed to be strictly business. He did have a few accessories which I noticed & loved: the waiters’ blue pin-striped aprons were a smart touch in a room filled with blacks, browns, and whites; my girlfriend’s cocktail was delivered on a “disco ball” metallic tiled serving tray; the entrees were delivered while my boyfriend was using the restroom and his meal was kept warm with a metal covering; the crumb scraper is always an A+, making a smooth & clean tablecloth after the main course (ok I’ll admit it, I tend to be a messy eater). The Perfect Bite: The calamari was like no other, but that was one of the better ragu pasta dishes I’ve tasted. Pappardelle is one of my favorites, and the sauce & pieces of rabbit meat worked perfectly together. Dena, are you kidding me? This is some serious restaurant reviewing you’re doing here. Holy mackerel I feel like I’m sitting at the table with you experiencing the whole meal.